craftytammie: sew full of summer! what do you say we get this weeklong party started! 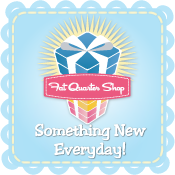 welcome our first sponsor, Fat Quarter Shop! Fat Quarter Shop is a great place to shop - not only do they have tons of fabrics to choose from, they also offer a lot of clubs and BOM! my favorite are the blogger's choice bundles they do each month. 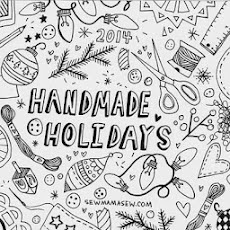 this month's bundle is by the sweet jeni baker of in color order. love the colors and prints she chose, and she made a cool "flagged" quilt out of them! you can check it out here, she even wrote a tutorial! FQS has a really great online presence. they do regular giveaways on their blog, the jolly jabber, so be sure to subscribe to that! they participate in the fab shop hop, and have been frequent sponsors on #talknt, and i could go on. 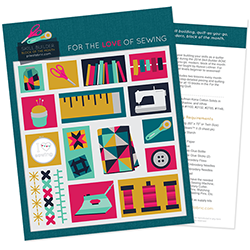 they're super supportive of us stitching bloggers! 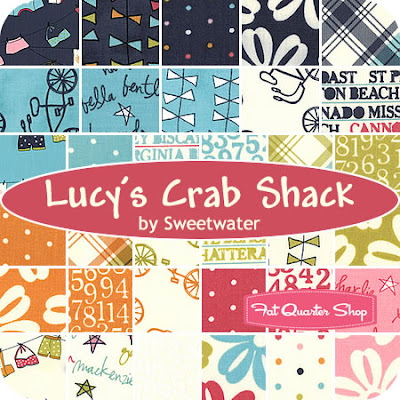 so - the amazing folks over at Fat Quarter Shop are giving away SIX charm packs of Lucy's Crab Shack by Sweetwater to ONE lucky person! want to win? the winner will be announced monday july 16th at noon CST. the lucky person will need to contact me within one week, or i will have to draw a new winner! and i will be back later today with a mini tutorial of my own to share! psst - it uses charms! thanks for reading! I like charms best! They are an affordable way of sampling a line of fabric! Layer Cakes are my favorite! Thanks for the chance to win!! I like fat quarters! Thank you for a great giveaway! I used to really like charm packs, but I really favor fat quarters now. They are so much more versatile. Probably fat quarters, followed by charms. I just bought some 1/2 yards of Lucy's Crab Shack. Love it! I love fat quarters, and charm packs. And I love these fabrics. Thanks for the chance to win.. I like fat quarters best. I like charm packs because you can see all the fabrics with only a small investment. Then I go back & get FQs or more of the ones I really like. Thanks for the chance to win! Just entering my 2nd week of quilting so I am not really sure. But winning any fabric would be fantastic! 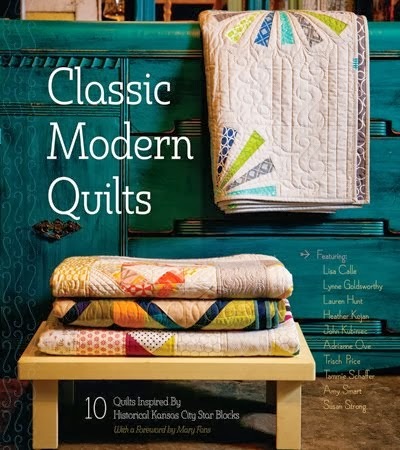 I love quilting already! Great table runner Tammie! I've had one on my list for a while now; maybe yours will get me motivated! Six charm packs to one person?? Awesome :) Thanks FQS and Tammie for the awesome giveaway!! Great giveaway. My favorite is charm packs. Layer Cake or Fat Quarter Bundle! What an amazing giveaway. I love charm packs and layer cakes (cupcakes, too...but that's another story). Thanks for the chance to win :-) Charm packs are my favorite pre-cuts! These days I am really into 1/2 yd bundles! My favorite pre-cuts are charm packs or fq bundles. Love seeing every single print in a fabric line and using them in a project. My favorite precut is probably layer cakes. But I usually don't spend the money, so I buy charm packs. My current favorite is charm packs because I have them on hand always. I'm really wanting to work with jelly rolls too. I love charm packs! Thanks for the chance! I'm just loving Alpine Wonderland right now. I think I like FQs the best. Fat quarters are my favorite, followed by charm packs...thanks!! I like FQs and then layer cakes. Moda Fabrics - I need some solids in my stash and these are so bright and cheery. I am in love with charm packs. Layer cakes. They're big enough but not so big that they're hard to handle. My favorite pre-cuts are fat quarter bundles: they're a great way to get enough fabric to work with without having it around for ages and ages. I LOVE fat quarters. thanks for this chance. I have never tried jelly rolls, but I do love charm packs! I love layer cakes but will take a charm any day of the week! My favorite pre-cut is fat quarters but I probably use charms more often. I love fat quarters, but if I'm using a line of something, I find layer cakes and charms easier to just get going with. For me the charms, I can do sooo much with these. I am particularly fond of Fat Quarters. They meet my needs right after yardage! I love charm packs :) My favourite way to see a whole range of fabric! HELLO!My favorite pre-cut is a jelly roll! Thanks for sharing! My fave pre-cut is a layer cake. I like being able to see more of the design than what's on jelly rolls. I have two favorite pre-cuts, layer cakes and charm squares. There are great reasons and specific paterns made for the different pre-cuts that it's just smart to use them. Thank you and FQS for a generous giveaway and a chance to win. My favorite precut is any neutral Kona cotton, so I don't have to cut all of those squares or strips for quilting! I am loving charm squares at the moment. Last year it was jelly rolls and layer cakes so who knows what it will be next year. I'm definitely a charm pack lover. Its a great affordable way to play around with an entire fabric line.